You are in Australia at the moment on a Student Visa and you hope to get Permanent Residence here after you have gained an Australian qualification as a result of 2 years of study here. Let's explore which Visa you may be eligible to apply for. 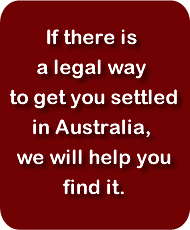 You may also be eligible to apply for an Employer-sponsored Visa (Subclass 457, 186 or 187), any of which will grant you a Bridging A visa and therefore permission to remain in Australia. If there is something in your current situation that you would like to have clarified, or if you would like independent confirmation that, having finished your studies in Australia, you are eligible to apply for a Visa, call us on 8410 6262 to make an appointment if you are in Adelaide: we have a discounted consultation fee for international students in Adelaide. If you are interstate, with a detailed explanation of your situation with your Curriculum Vitae or Resumé as an attachment. Within 3 days of confirmation of payment of our consulation fee we will send you detailed and thorough advice by email and make a follow-up phone call to talk things through with you soon after.